Feb. 11, 2019 -- At the age of 27, Kim DeMott says, her life was looking bleak. After being diagnosed with lupus, she had infections, rashes, and incredible pain all over her body. Over the next several years, her health declined as new diagnoses came: fibromyalgia, osteoarthritis, and Sjogren’s syndrome. Her pain became so severe she started using a cane to walk, and she says at her lowest point, she was taking 28 medications a day, including several opioids for chronic pain. “I wasn’t able to be a good mom to my kids. I wasn’t able to function. I had zero quality of life. I was just miserable,” the California mother of two says. Then in 2016, DeMott learned about kratom from a friend taking it for lupus symptoms. She decided to give the herbal supplement a try. She ordered some online and brewed it into a tea. Relief came with the first cup, she says. DeMott says she still has chronic pain and health issues, but kratom dulls the pain enough that she can function. That’s why she’s organized two rallies -- one in California and one in Washington, D.C. -- to push the government to keep the herb legal. She and other kratom users and advocates are growing more concerned about news that the Drug Enforcement Administration (DEA) is considering labeling it as a Schedule I drug -- a category that includes heroin, ecstasy, marijuana, and LSD. It would also make the drug illegal on a federal level. Federal officials have said they are concerned that kratom can be abused because of its opioid-like effects. It’s now illegal in six states and the District of Columbia, and it’s been on the DEA’s list of drugs and chemicals of concern for several years. “There are no proven uses for kratom and #FDA strongly discourages the public from consuming it. Kratom is an opioid and it’s an inherently addictive product that can cause harm, which is reason enough not to consume it, but also may make users sick,” FDA Commissioner Scott Gottlieb, MD, tweeted in August 2018. Kratom is a tropical tree in Southeast Asia. Its leaves have been used for hundreds of years to relieve pain. They can be eaten raw, but more often are crushed and brewed as tea or turned into capsules, tablets, and liquids. In low doses, kratom is a stimulant. In large amounts, it’s a sedative, and the National Institute on Drug Abuse (NIDA) says it can lead to symptoms of psychosis and dependence. The DEA notes that its use appears to be going up. U.S. poison control centers received 263 calls about kratom in 2015, ten times the amount in 2010, the CDC says. According to the CDC, about 42% of cases of kratom use reported between 2010 and 2015 involved non-life-threatening symptoms that required some treatment. About 7% of cases were classified as major and life-threatening. The DEA warns health risks in kratom abusers can include seizures, hallucinations, and death. Government agencies say there have been 44 deaths related to kratom and say at least one is being investigated as involving “pure kratom.” But NIDA says most deaths linked to kratom seemed to have happened when people used it along with illegal drugs or prescription medications. That’s consistent with the finding of a 2019 study out of the University of Colorado that reviewed 15 kratom-related deaths between 1997 and 2017 in Colorado and found other drugs present in 14 of the cases. In terms of how it works, a 2016 study found that in mice, kratom targets a part of the brain that responds to opioid drugs like morphine, codeine, and fentanyl. But that study found that unlike morphine, it does not lead to harmful side effects like slowed breathing -- called respiratory depression -- constipation, and physical dependence. Since most deaths from opioid overdose are because of respiratory depression, some believe kratom merits further study to see if some of its compounds can be harnessed for medical benefits that may be less addictive. Walter C. Prozialeck, PhD, a professor of pharmacology and pharmaceutical sciences at Midwestern University in Downers Grove, IL, has analyzed about 100 studies on kratom up until 2016 and now consults with other kratom researchers. He says unscientific reports suggest kratom is less addictive than opioids, but he says many companies in the U.S. advertise it as a legal high. Several Southeast Asian countries have outlawed it. “By any measure, kratom would be less harmful and less addictive than something like heroin. If you look at the evidence, you have to conclude that,” Prozialeck says. “But kratom can induce a state of physical dependence." “It is probably addictive, but its addictive equivalent is something like coffee, which isn’t surprising because the leaf is in the coffee family,” says Christopher R. McCurdy, PhD, a professor of medicinal chemistry at the University of Florida in Gainesville. His research on mice shows that kratom may be able to treat opioid withdrawal with few side effects, and he says people who use kratom for this purpose typically don’t have withdrawals or, if they happen, they are mild. Advocates say kratom offers relief from pain, depression, and anxiety. Dijon Evans, 55, of Sacramento, CA, turned to it 3 years ago to manage chronic pain from nerve damage. “There was no high. I just felt better. I could move. I could breathe without all the pain. I felt alive again. I didn’t feel buried by the pain,” she says. For that reason, some scientists say kratom may hold the key to treating chronic pain and may even be a tool to combat addiction to opioid medications. McCurdy and his colleagues just received a $3.5 million grant from the NIDA to study the plant’s components over the next 2 years to better understand how it works how it can be abused. “It’s very clear that the National Institute on Drug Abuse wants to understand the science of this plant and the components of this plant because of the anecdotal stories and community of users showing this is working well to keep them off of opiates and the historical usage of this plant to wean people off opium or prescription drugs,” McCurdy says. Kratom is used for self-treatment of mood and anxiety disorders, pain, and withdrawal symptoms that come with prescription opioid use, but research about its effects is mixed. Studies published in 2017 and 2018 found it to have few negative effects, including nausea and constipation, but those were generally only present at high doses or when taken frequently. Another 2018 study found that among those taking higher amounts, it didn’t affect how well they moved, or their memory, attention, or mental control skills. But other new studies suggest that as use of kratom rises, so do reports of dependence, tolerance, and withdrawal when people try to stop taking it. The NIDA says that kratom can cause effects similar to opioids and stimulants, and that two of the compounds in kratom leaves interact with opioid receptors in the brain to produce sedation, pleasure, and decreased pain -- especially when taken in large amounts. Cornel N. Stanciu, MD, director of addiction services at New Hampshire Hospital, co-authored a 2018 study that reported on two case studies of patients who had severe and long-lasting withdrawal symptoms associated with kratom. "Symptoms of withdrawal, just like with opioids, include both physiological, such as sweating, chills, body aches, [and] diarrhea, as well as psychological, such as insomnia, restlessness, irritability, anxiety, and mood disturbances, and sometimes hallucinations," he says. McCurdy says differing research results can be due to the lack of consistency of products in the commercial marketplace, given the lack of standardization or control. He also says these products are different from traditional preparations that have been used for centuries in Southeast Asia. 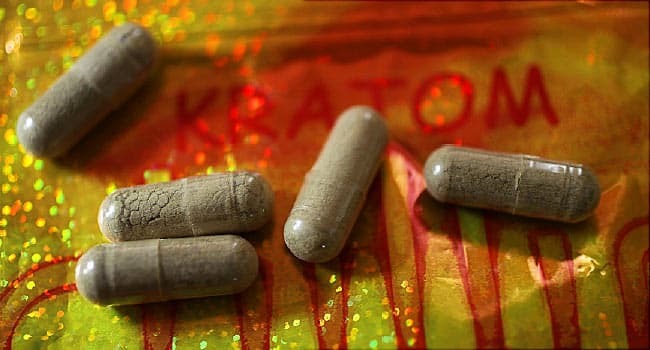 A June 2018 study that looked at kratom as single compounds in their purest form found one compound that does not have abuse or addiction potential in rats, but another that might, and could compel the user to take other opiates. But McCurdy stresses these results don’t mean that holds true for kratom. In February 2018, the FDA said scientific evidence found opioid compounds in kratom, which it says shows its potential for abuse. Gottlieb, the FDA commissioner, has said he knows kratom has gotten more popular in recent years. He says that’s because of “unsubstantiated claims about its purported benefits.” He also says he knows people have unmet needs when it comes to treating pain or addiction disorders. But he says there’s no reliable evidence to support kratom’s use for that. Gottlieb has repeatedly told consumers to avoid the herbal supplement -- citing a variety of concerns, including a salmonella outbreak connected to kratom that affected nearly 200 people in 41 states; kratom products containing bacteria, opioid components, and heavy metals; companies claiming their products have medical benefits; and his concerns that it could be addictive. DEA spokesperson Katherine Pfaff says the agency is weighing evidence to determine whether kratom should be labeled a Schedule 1 drug. The agency is looking at an October 2017 Department of Health and Human Services report that recommends a ban on the chemicals in kratom, saying they should be permanently controlled in Schedule 1 of the Controlled Substances Act. Pfaff says the agency is reviewing “all available data” to make a final decision. She says there is no time frame for that decision, adding it can take months or even years. But that decision was put on hold after protests and outrage. The DEA says it is considering public comments made at that time as part of its current scheduling decision. Years later, pushback remains strong. The American Kratom Association submitted a petition in support of kratom from more than 40,000 Americans in August. And in December, the group issued a 27-page policy report, in which it said the FDA has failed to provide the data or science showing kratom should be listed as a Schedule I substance. The association is encouraging kratom manufacturers to commit to quality standards to better police themselves. And McCurdy is bringing together scientists from around the world for a second international kratom research meeting in February. The first was held in 2017 in Malaysia. As for DeMott, she feels comfortable with the vendor she buys her kratom from, and says she has never been high from it or had withdrawal symptoms -- even when she weaned herself off it for several weeks for a medical procedure. These days, she says she takes about 2.5 grams, three to six times a day -- taking it on its own or mixing it with juice or water. It costs her about $60 a month, but she says the relief it brings is priceless. Even so, DeMott says she understands the government’s concerns about quality control. Her hope is that something can be worked out that doesn’t involve banning the plant. Walter C. Prozialeck, PhD, professor of pharmacology and pharmaceutical sciences, Midwestern University, Downers Grove, IL. Scott Gottlieb, MD, FDA commissioner. Twitter: @SGottliebFDA, Aug. 17, 2018. U.S. Department of Health and Human Services spokesperson. Huffington Post: "Congress Calls Out DEA For Unilateral Move To Expand The War On Drugs." Federal Register: "Withdrawal of Notice of Intent to Temporarily Place Mitragynine and 7- Hydroxymitragynine into Schedule I."